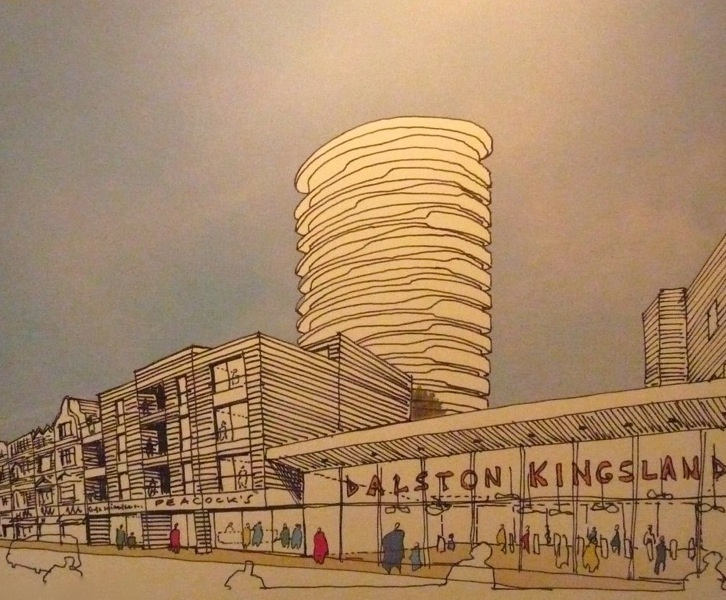 MORE DETAILS have emerged of the building proposed for the Peacocks site next to Dalston Kingsland station. The 18-floor Hanging Gardens of Babylon tower is out, replaced by a 19-floor Chinese lantern-shaped block. Architects from Chelsea’s Jestico and Whiles, which took over from Bayswater practice BFLS after Hackney councillors rejected the previous scheme, were herded today Wed 11 July 2012 into a small meeting room at the CLR James Library to explain the scheme to the public, watched by a gang of corporate affairs men (a creep of corporate affairs?). Dalstoners hoping to see a good model to give them a sense of scale and context saw only a rudimentary polystyrene representation. No brochure with pictures of the building was offered for examination in quieter circumstances — but the “creep” was certain that the images would be put on the scheme’s hastily set up website today. The owner, property investor Rothas, had a public-relations team tell Loving Dalston several times that the proposal would not be sold on if the investor won council approval but would be carried out. The sky-rise would be built by Rothas, even though it lacked development experience. The PR team Four Communications is now silent on this project. * For previous story and comments on the Lantern press this link. Gosh! yes, Ed. I do hate TLAs, don’t you? KHS = a very dodgy organisation called Knights of the Holy Sepulchre or possibly, in this case, Kingsland High Street. TLA = three letter abbreviations. Ah, thank you. I find abbreviations generally alienating, especially at meetings when one is the only person in the room not in on the secret of initials’ meanings. Talking of which, am I also the last to know that these “knights” have a pals act going on in Hackney? — Ed. I agree with you that there is a housing shortage, Benjamin, but that doesn’t mean developers should be given carte blanche to throw up any old thing. Nineteen floors is too high compared with the rest of KHS — and I’m from Birmingham originally and I like the Rotunda. I’m not sure how you define “any old thing”, but of course it’s “high compared with the rest of KHS”! That’s the point of it — to supply a large quantity of much-needed homes near jobs and a public transport hub, in line with current environmental urban planning thinking. I wish someone would tell me what KHS is. — Ed. “A corporate finger in the air”?! Or, as some may call it, much-needed homes. Sorry for repeating myself, but no one seems to offer an answer — we have a huge housing shortage… where is everyone going to live? There is the a predictable knee-jerk reaction in here to any new private development in Dalston. As for it looking “hideous”, I suspect that people would have had the same reaction to the rough designs for 33 St Mary Axe [Exchequer Court], the Shard or the London Eye. It’s all about the detailing, materials budget, etc. What is evident is that it [the Peacocks-site plan] is not a formal geometric shape. Which is promising. We need more information about the shaping, textures, colours and lighting of the building. Also about the improved access to the station (step-free) and the public realm and landscaping. That the site is currently occupied by an appalling building, and that the station frontage at Kingsland is causing problems of overcrowding. This should be part of a solution. But the notion of a Chinese lantern as inspiration for a building is interesting. Nineteen stories are OK if this is an exceptional building. But there is not enough information yet, and I couldn’t make it to the exhibition. I look out to the Kinetica building at the back of my house, and enjoy its form and shape. I walk by the Rhodes Estate: low-rise, zero-quality council housing. Whatever happens, Dalston Kingsland station must be improved. I have been dismayed that the suggested planning gain has not been to provide easier access, including for disabled people, and a platform to allow DK users access to the East London Line rather than watching the trains whiz past on their way to Highbury or south London. — Ed. As I recall the first design did include a new access and step-free entry to the platform.